Purpose:For removal of light scale from pan, evaporator, juice heaters tube. Purpose: For cleaning more space or where rotary brush can not be used. 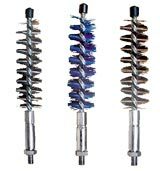 NOTE: All Above Brushes are available with Spring Steel wire, Stainless Steel wire or Brass wire. For detail about gauge of wire, arbor bore of brushes, please contact us. Max. Size of Brush: 2 (50.8mm). Max. Size of Brush: 8 (203.2mm). Wire fill Material : Steel, Brass, Stainless Steel. Max. Size of Brush: 3 (76.2 mm). Wire fill Material: Nylon, Steel. SSB Single Spiral Brush Model Nos. DSB Double Spiral Brush Model Nos. For Manual Use Model Nos.